GW3965 HCl is a potent, selective LXR agonist for hLXRα and hLXRβ with EC50 of 190 and 30 nM in cell-free assays, respectively. a. Western blot analysis for EpCAM, PKM2, and CK19 expression in livers from C57BL/6J mice treated with DDC for 1 week in the absence or presence of GW3965 (10 mg/kg; n = 4 per group). *P < 0.05, **P < 0.01. c Western blot analysis of p-STAT3, t-STAT3, and SOCS3 in WB-F344 cells treated with GW3965 (5 μM) or DMSO as control in response to IL-6 (50 ng/ml) treatment for 0, 0.25, 0.5, 0.75, 1, and 2 h.
Arch Toxicol, 2017, 91(1):271-287. GW3965 HCl purchased from Selleck. Exp Neurol, 2018, 304:21-29. GW3965 HCl purchased from Selleck. The interaction of liver X receptor a (LXRa) and b-catenin is involved in oxLDL regulation of DKK1. Western blot analysis of cells pretreated with DMSO or GW3965 (1 μM). FEBS Lett, 2015, 589(1):52-8.. GW3965 HCl purchased from Selleck. The effects of GW3965 on NDV infection. (A) The DF-1 cells were cultured with different concentrations of GW3965. Cell viability was determined by MTT assay at 24 h. (B) Synthetic LXR agonist GW3965 inhibited NDV infection in DF-1 cells. Cells were pretreated with GW3965 (1 μM) for 2 h, then infected with NDV (MOI = 1). GW3965 (1 μM) was continuously present during the infection. The expression level of the viral NP protein was determined by western blot. (C) The titers of the supernatant were determined by TCID50. (D) The viral gRNA in cells was detected by qRT-PCR assay. Arch Virol, 2016, 161(9):2491-501.. GW3965 HCl purchased from Selleck. Formulation: GW3965 is dissolved in 0.5% Methyl Cellulose. Collins JL, et al. J Med Chem. 2002, 45(10), 1963-1966. Joseph SB, et al. Proc Natl Acad Sci U S A. 2002, 99(11), 7604-7609. Leik CE, et al. Br J Pharmacol. 2007, 151(4), 450-456. Scholz H, et al. Diabetologia. 2009, 52(7), 1352-1362. Guo D, et al. Cancer Discov. 2011, 1(5), 442-456. How to formulate the compound for mouse in vivo experiment? S2630 GW3965 HCl can be dissolved in 2% DMSO/30% PEG 300/dd H2O at 10 mg/mL as a homogeneous suspension. This vehicle is suitable for oral gavage to mice. SR9243 is a potent and selective LXR inverse agonist. T0901317 is a potent and selective agonist for both LXR and FXR, with EC50 of ~50 nM and 5 μM, respectively. 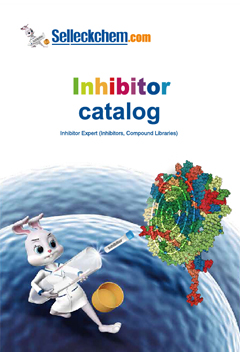 Features:Dabigatran is a reversible, competitive, direct thrombin inhibitor.